According to Hugo (2006), words attack is a strategy that motivates students to read for understanding by decoding, pronouncing and understanding unfamiliar words. Decoding, pronouncing and understanding unfamiliar words in a text allows readers to learn about a text before they read it. Through this process, student’s doing library research, for example, can make more informed decisions about wether the texts will help them with their research. Readers may also choose to the texts they are assigned to read in their classes; they will become familiar with the text’s vocabulary, main points, and organization, which will make the actual reading of the text much easier. 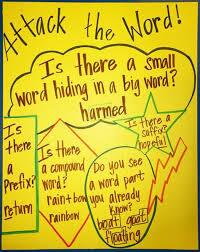 According to Meier (2010), words attack strategy allows students to focuses on decoding and pronunciation. They focus on the student look at the word from a different perspective, and attacking them piece-by-piece to understand the meaning overall. In addition, according to Carin (1993:116), word’s attack strategy is a technique of learning that exposes students to a problem and can affect a student to be able to solve problems, answer questions, gain knowledge,decoding,pronouncing, understanding unfamiliar words and be able to make a decision. In addition, Alison (2012), it is important for studnts to study words and word-attack skills, so they have strategy to use when they come to a difficult or unknown word. Word attack skills are taugh through phonemic awareness, phonology, phonics, orthography, and morphology. States that words attack is a strategy to help your students decode, pronounce and understand unfamiliar words. It helps students attack words piece by piece or from a different angle. It is important for students to study words and words-attack skills, so they have strategy to use when they come to a difficult or unknown word. According to Nuttal (1996), word-attack strategy deal with lexical items and the development of vocabulary. As student’s are unlikely to know every word they come across in a text, they need strategy for dealing with unknown lexis. So they need to have it explained to them that they wilmeet three different kinds of unknown words. These are key words, words which can be ignored, and words which can be inferred. Key words need to be understood, and therefore the sensibleuse of a dictionary is a good idea. Students need to practice selecting the right meaning that is relevant to the given content from several others. We can devise multiple choice exercise to ask students to choose the right definition with different words which may look very alike. Anyway remember that it is up to the students to select the appropriate definition, not the teacher. Other words, however, are not significant for a general understanding of the text, and these can be ignored when we are reading. But very often students will meet with some words which are not a important as the key words but they can’t be ignored. In this case, inferring is quite helpful. Consider the following sentence; when their car broke down, the whole family had to walk home- a distance of ten bca. It’s quite easy to guess the meaning of the nonsense word “bca” is a kilometer or a mile. Belum ada tanggapan untuk "Words Attack Strategy in Reading"